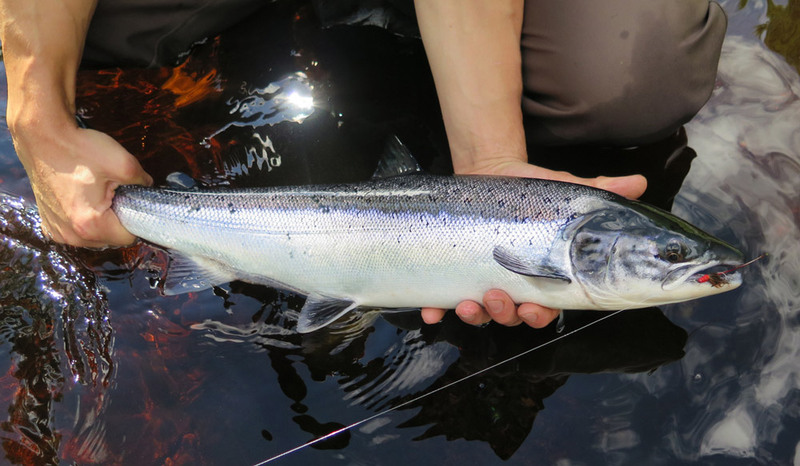 There is a long history of fishing for Atlantic salmon and sea-trout throughout the Northern Highlands, which boasts some of the very best salmon rivers in Scotland. The North Coast 500 route passes over more than 50 salmon and sea trout rivers some of which are part of larger systems that also offer lochs with fishing for migratory fish. The larger rivers are to be found on the East and North Coasts where the catchments are generally larger, and the topography releases water more slowly. On the West Coast, the rivers systems are much shorter, and some of the catchment is very steep, or bare rock which means that the water run-off can be very fast. These types of rivers are known as spate rivers, and water levels can rise very quickly, allowing salmon to migrate, and then drop to very low flow rates, until the next fresh rainfall – the best opportunity to catch salmon is after the rain, as the spate recedes. Thankfully (for anglers at least), the prevailing westerlies and coastal mountain ranges mean that rain is fairly frequent. It is for this reason that the best East Coast rivers tend to be the ones whose catchments extend furthest west and therefore benefit from this rainfall also. The West Coast rivers are also more seasonal, with most of the fishing in the summer months. The salmon fishing promoted on this site is focussed on that available to visiting anglers to the region. Most of the rivers and beats in the Northern Highlands are privately owned by estates, and salmon fishing is let by the week, often with estate lodges or cottages. Individual anglers and larger sporting parties commonly return year after year to fish the same river and beat, and so it can be very difficult to get on these rivers; a phenomenon known as “dead-man’s shoes”! This type of fishing is therefore unlikely to be available to the visiting angler, particularly those touring who may just want a day here or there of fishing, or a guided salmon fishing experience. There are a few estates and fisheries that operate flexible booking systems allowing for single-day lets, and many angling clubs offer visitors ‘day tickets’ through local outlets. In addition there are some hotels on the route that offer their guests access to salmon and sea trout fishing, so these three sources provide the content for the listings on this site, and many beats and even some complete river systems are ignored if there is no realistic opportunity to fish them. The legal season for salmon and sea trout fishing in Scotland varies from river to river. In some cases the legal opening date is earlier than fisheries choose to open, or when fresh salmon runs are expected, so in the fishery descriptions we have indicated the approximate dates of the main season rather than the statutory season dates. In most cases this is March or April, and all rivers in the Northern Highlands are closed by the end of October. There is no requirement in Scotland to have a rod licence to fish, however anglers must have permission i.e. a fishing permit, and it is a criminal offence to fish for salmon without it, so please ensure that you buy a permit from the appropriate source before you start fishing. Salmon and sea trout fishing is not permitted on Sundays anywhere in Scotland. On most salmon rivers, fly fishing is the traditional and only method permitted, as it is best suited to modern angling conservation practices, though on some of the larger rivers spinning is permitted, particularly in early season and/or in exceptionally high water. Atlantic salmon are an endangered species. Although their highest mortality rate by far is at sea, the Scottish Government, local fishery boards and fishery owners have introduced various management practices and regulations to protect salmon stocks in Scottish rivers and lochs. Since 2016 all Scottish rivers/districts have been allocated to one of the following three grades each with their own recommended management actions. This is reviewed annually so rivers may move between different categories and management plans over time. Category 1 - in these rivers, exploitation is considered sustainable and no additional management action is required. Category 2 – management action is necessary to reduce exploitation; mandatory catch and release is not required in the first instance, but this will be reviewed annually. Category 3 – exploitation is unsustainable and mandatory catch and release for one year is required. All salmon caught in Scotland before April 1st must be returned by law. Regardless of conservation status (Category 1 and 2) all fishery boards and most fisheries will promote additional conservation policies to protect their stocks. These policies will therefore result in local regulations regarding fishing methods, and limits on retaining fish e.g. fly only, catch & release of all spring salmon, return of all salmon over a certain size etc. Most fishery boards, fishery owners and permit outlets in Scotland are now taking the most careful biosecurity measures to make sure that the parasite Gyrodactylus salaris does not enter our rivers. Gyrodactylus salaris is an extremely dangerous parasite that has destroyed the salmon stocks of over 20 rivers in Norway, and has spread to Russia, Finland, Sweden, Germany, Spain and Portugal. Most Highland salmon fisheries now require anglers to complete a declaration before starting to fish, stating that either their equipment has not been outside of the UK in the past 2 to 4 weeks, or that it has been sterilised by one of the methods described below. Immersion in a solution suitable for killing Gs for a minimum of 10 minutes. These include: Virkon (1%), Wescodyne (1%), sodium chloride (3%) and sodium hydroxide (0.2%).